Velocardiofacial syndrome (VCFS) is associated with a chromosome 22q11deletion and a high prevalence of schizophrenia. van Amelsvoort et al Article studied brain anatomy in adults with VCFS with andwithout schizophrenia. Decreased white matter and increased cerebrospinalfluid volume were observed in the group with VCFS and schizophrenia comparedwith both a VCFS group without schizophrenia and a control group. 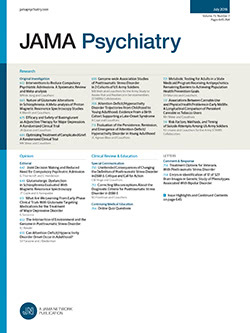 Vos et al Article have modeled Australian surveydata on major depression together with meta-analyses of the internationalliterature on the natural history of disease and the effect of interventions.Maintenance treatment with cognitive behavioral therapy or antidepressantscan halve the burden of depression even if realistic adherence of 60% is takeninto account. By contrast, episodic treatment strategies can avert not morethan a quarter of disease burden. Grant et al Article found that 12.8% of the USadult population had DSM-IV nicotine dependence andthat these individuals were highly comorbid with other Axis I and II psychiatricdisorders. Individuals with nicotine dependence, psychiatric disorders, andcomorbid disorders carry a very large share of the burden of all US tobaccoconsumption. Results underscore the need to target smoking prevention and/orcessation efforts at these vulnerable subgroups who may more likely have beeninfluenced by tobacco advertising. Early-onset engagement in behaviors with addictive potential has beenassociated with addiction and psychiatric problems of greater severity. Usingdata from the Gambling Impact and Behavior Study, Lynch et al Article examinedthe relationship between gambling and psychiatric health in adolescents andyoung adults grouped by age at gambling onset. Adolescent-onset gambling wasassociated with more severe psychiatric problems, particularly substance usedisorders, in adolescents and young adults, suggesting that gambling duringadolescence may affect adult psychiatric functioning. Giltay et al Article investigated dispositionaloptimism in relation to mortality in a population-based study of 999 elderlymen and women during the follow-up of 9 years. Dispositional optimism wasassessed with questions about positive thinking, a desire to achieve new goals,and a sense of happiness and joy. Results support a protective relationshipbetween optimism and all-cause mortality, especially cardiovascular mortality. The N-methyl-D-aspartate receptoragonist D-cycloserine facilitates extinction of fear in preclinical studies.In this double-blind study by Ressler et al Article ,patients with fear of heights given D-cycloserine, in combination with exposure-basedpsychotherapy, had greater reductions, compared with placebo, in fear withina virtual reality setting, less spontaneous skin conductance in fear withina virtual reality setting, less spontaneous skin conductance fluctuations,less generalized acrophobia, and more self-exposure to heights at 1-week and3-month follow-ups. These data provide initial support for the use of cognitiveenhancers as adjuncts to psychotherapy. A polymorphism in the human serotonin transporter gene promoter (5-HTTLPR)is associated with anxiety and increased risk for developing depression inthe face of adversity. Barr et al Article report thatamong female macaques, a functionally equivalent polymorphism (rh5-HTTLPR)interacts with early adversity to produce increased alcohol preference, withprogressive increases in intake observed following successive alcohol exposures.By extension, this suggests that the 5-HTTLPR genotype and early adversitymay interact to increase vulnerability to alcoholism in women. Wagner et al Article conducted a multicenterrandomized double-blind placebo-controlled 16-week trial to assess the efficacyand safety of paroxetine in the treatment of 322 children and adolescentswith social anxiety disorder. Response rates were significantly greater forparoxetine (77.6%) compared with placebo (38.3%). The benefit of paroxetinetreatment was apparent within the first 4 weeks of treatment. Paroxetine wasgenerally well tolerated, and withdrawals due to adverse events were infrequent. Murphy et al Article studied the effects of theserotonin transporter gene promoter “long/short” polymorphism(5HTTLPR) in geriatric patients with major depression treated with eitherparoxetine hydrochloride or mirtazapine. Among patients treated with paroxetine,those with the S/S genotypeshowed more discontinuations due to adverse events than did S/L and L/L carriers. Surprisingly, among patients treated with mirtazapine, L/L genotype carriers showed themost treatment discontinuations. These results demonstrate that the effectsof the 5HTTLPR may depend on antidepressant mechanism of action.